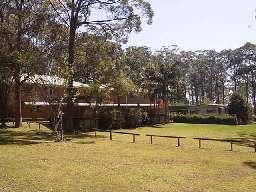 Camp Tamborine, located at Mt Tamborine with close access to the Gold Coast and to bushwalks and scenic lookouts, is and ideal campsite for retreats for smaller groups (sleeps up to 88). 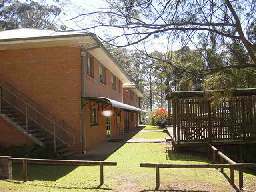 Camp Tamborine has sleeping accommodation in the upstairs areas of both buildings and shower and toilet facilities are located at the end of each of the buildings. Laundry facilities with washers and dryers are also available for use. The conference hall is equipped with comfortable seating, good lighting and a white board. Further equipment is added from time to time. The slow combustion fire warms the hall and creates atmosphere. The dining hall is spacious and equipped with padded seating, wide tables, a slow combustion stove for warmth and a large book display area to equip a bookshop. The kitchen is well equipped with a water boiler, large gas range, cold room, freezer, food mixer, crockery and cutlery etc.